With integration provided by Dicom Systems, the app will allow nurses and doctors to easily share and upload clinical smartphone images. Nicklaus Children’s Health System in Miami, Florida is deploying an app-based clinical image sharing tool, tapping startup WinguMD and medical imaging company Dicom Systems. 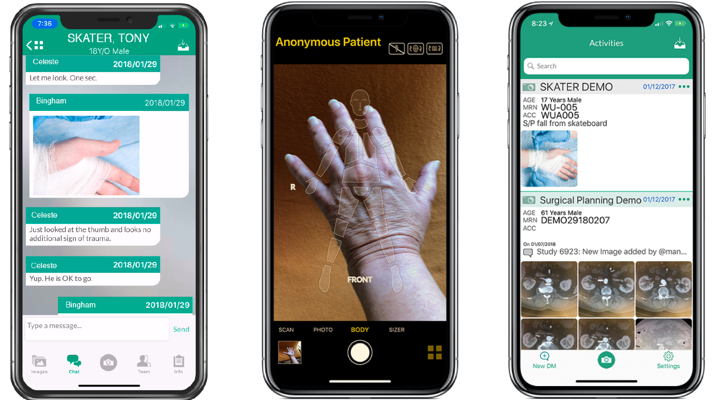 WinguMD’s BodyMapSnap app allows clinicians to take pictures and share them with one another on a social media-like platform. Images can be associated with particular patients either from the start or retroactively and, thanks to technology integration provided by DICOM, clinicians can also upload those images to the EHR and other data repositories. Nicklaus plans to issue pre-loaded iPads with the software to new residents, as well as making it available to the current staff. WinguMD cofounders Manabu Tokunaga and Dr. Oliver Aalami founded the company a few years ago when Aalami, a vascular surgeon, observed the need for a Slack-like collaboration tool that addressed the particular security and accuracy needs of doctors. Nicklaus is a high-profile early customer for the young startup. A well-known innovator, the health system was named number one on CHIME’s recently-released 2018 Most Wired Hospitals list. MobiHealthNews profiled Nicklaus at HIMSS Global Conference last year, when CIO Ed Martinez was showing off its deployment of patient-doctor communication tool HealthGrid (since acquired by Allscripts). Mobile clinical communication tools like Voalte, Spok and Tigertext were some of the earliest successful mobile health companies, and continue to be a big business. But WinguMD, with its social setup and focus on images, is something a bit different. It’s also comparable to Figure 1, a well-funded app often described as an “Instagram for doctors.” But while WinguMD is focused on facilitating image-sharing within a practice, Figure 1 is more about letting doctors share (de-identified) images with all other users of the app, potentially to crowdsource tricky diagnoses from doctors at other institutions.